Foraminifera, with their extensive fossil record and global distribution, have proven useful in the field of geology and paleoclimatology. Global interest in the health and management of marine ecosystems sees a growing interest in using benthic foraminifera for bio-­?monitoring. The standardisation of methodology has been suggested to unify the sampling practices used by various research groups. During the late 1990’s surveys of the New Zealand benthic foraminifera populations were undertaken. One of the locations included in this census was Purakanui Inlet, to the north of Dunedin. 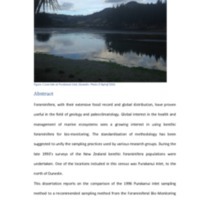 This dissertation reports on the comparison of the 1996 Purakanui Inlet sampling method to a recommended sampling method from the Foraminiferal Bio-­?Monitoring workshop. The foraminiferal association is identified and comparison between the two sampling methods was shown to have no difference in results. Nyhof, Dianne, “A comparison of two sampling methods for benthic foraminifera in modern ecosystems.,” Otago Geology Theses, accessed April 22, 2019, http://theses.otagogeology.org.nz/items/show/637.